Are you interested in teaching Pilates with us? We are currently hiring! Click here for more details. Bookings essential. Please call us on 6253 2388 for all Pilates enquiries or to book your class or session (See timetable below). Our classes focus on a small client to instructor ratio (1:8 for mat class and stretching, 1:6 for post natal and 1:4 for reformer) to ensure closer attention paid to each class member. With limited availability, classes will fill quickly so get in early to book your preference. Studio sessions make use of Pilates specific equipment such as the Reformer, Trapeze table, Chair, Ladder barrel and spine corrector dependent on client needs and goals. Private (one on one), Duet (2 people) and Semi private (3 people) sessions have low client/instructor ratios allowing for increased instructor attention and guidance. Programs are tailored for individual needs and goals so are suitable for rehabilitation, pregnancy and beginners through to elite athletes. A private session is required for all clients new to the Clinic 88 studio. Post assessment the instructor will recommend a suitable Pilates plan for you. Studio sessions are offered Monday – Saturday in set periods of instructor availability. Please call the clinic to enquire or book. Mat Pilates classes (max.8 per class) are a full body conditioning class based on the floor using your own body as resistance. Mat classes are great for general fitness levels and beginners. Clients must be injury free. Mat classes are booked in terms of 6-10 weeks depending on the calendar – timetable below. On booking into a Mat class you will attend the same day/time class for each week of the term and payment is made in advance to secure your spot. Maintain and build strength and mobility throughout your pregnancy with sessions programmed to focus on the working relationship of the abdominals, back and pelvic floor muscles. Pre-natal clients start with a private session enabling the instructor to assess your best plan. Post-natal we offer small, gentle, group classes (max.6 per class to make room for the bubs*!) with focus on comfort of the mother and baby to safely rebuild core strength after your pregnancy and get you back into exercise and daily living. 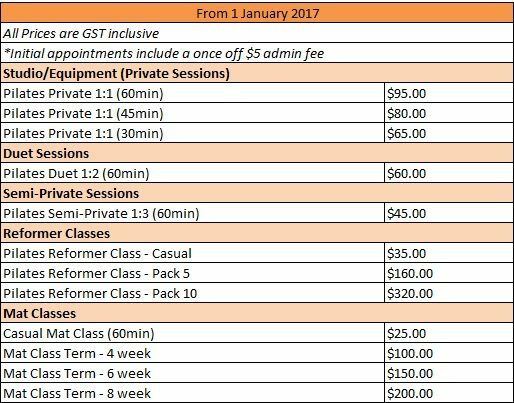 Post-natal classes are booked in terms as part of the group class timetable displayed below and the best part is that bub comes with you! *Applicable to bubs 6 weeks – 6 months age. Mat Pilates, Stretching and Post-Natal mums&bubs; Maximum 8 participants. 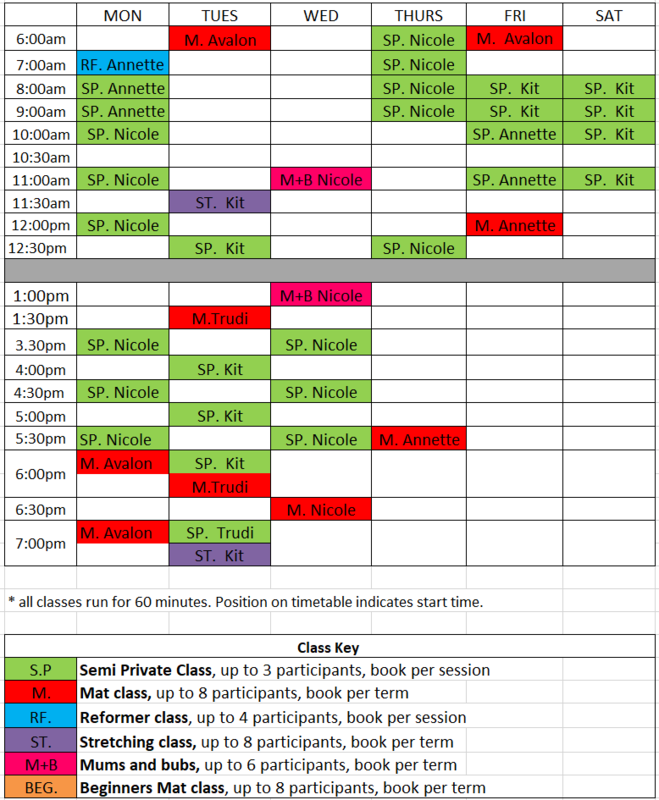 All of our mat classes are run in set blocks depending on the set schedule below. What is Pilates? Pilates is an exercise regime which strengthens and stretches the body. The dynamic routines create strong, lengthened muscles which improve posture and prevent injury. It trains the mind to understand which muscles should be worked during movement. It helps switch off muscles working unnecessarily and re-patterns injured or lazy muscles. What to wear? Something comfortable that allows movement, loose clothing is recommended. Please bring or wear clean socks for use on mats and equipment. What is your instructor/client ratio? Mat classes hold a maximum of 8 participants, limited to six for mums and bubs ensuring quality instruction. Reformer classes are maximum of 4 participants, semi private sessions cater for three people, duets for two people and a privates session is one on one with the instructor. Who are the instructors? Instruction at the Clinic 88 Studio is by Nicole Punch, Kit Tong, Trudi Wharton, and Alice Herbison. Our qualified instructors are experienced in a range of Pilates methods; mat work, reformer, stretching and equipment based.